The two large Impact Craters on Tethys, near the line where the day fades into the night (the so-called "Terminator Line"), almost resemble two giant eyes observing Saturn. The location of these aforementioned Impact Craters on Tethys' Terminator throws their topography into sharp relief. Both are large Impact Craters, but the larger and Southernmost of the two, shows a more complex structure. The angle of the lighting highlights a Central Peak in this Crater. In fact, Central Peaks are the final and well visible result of the Surface (of the impacted Celestial Body) reacting to the violent Post-Impact Excavation of the Crater itself. On the other hand, the Northern Crater does not show a similar Surface Feature. Why? No one knows for sure but, possibly, the impact was too small (better yet: to small AND slow) to form a Central Peak or, maybe, the composition of the Materials located in the immediate vicinities of the Impact Area couldn't support the formation of a Central Peak. 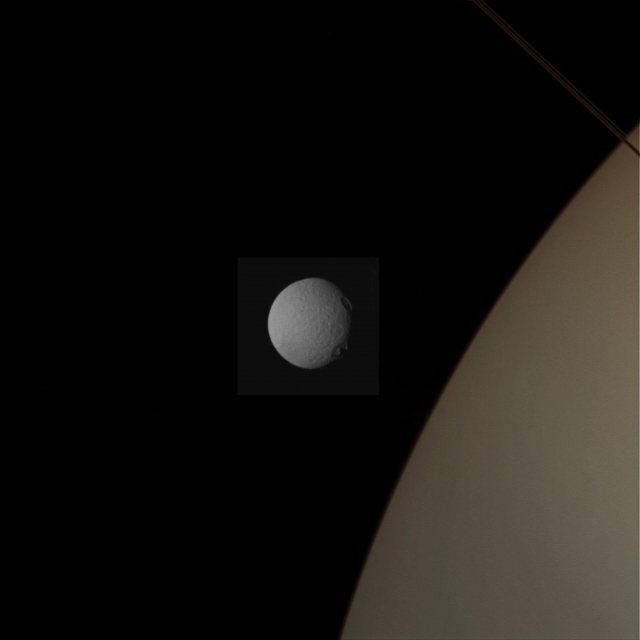 In this image, Tethys is significantly closer to the NASA - Cassini Spacecraft's Wide-Angle Camera, while the Ringed Gas-Giant Planet (---> Saturn) is in the background. And yet, the moon is still utterly dwarfed by Saturn. This view looks toward the Anti-Saturn Side of Tethys; North is up and rotated 42� to the right (Dx). The image was taken in Visible Light with the NASA - Cassini Spacecraft's Wide-Angle Camera on April 11, 2015. The view was obtained at a distance of approximately 75.000 miles (such as about 120.700,5 Km) from Tethys and the Image Scale on Tethys is roughly 4 miles (such as about 6,437 Km) per pixel. This frame (which is an Original NASA - CASSINI Spacecraft's b/w and NON Map-Projected image published on the NASA - Planetary Photojournal with the ID n. PIA 18318) has been additionally processed, contrast enhanced, magnified, in order to allow the vision of the slightest details of the Surface, Gamma corrected and then colorized - according to an educated guess (or, if you wish, an informed speculation) carried out by Dr Paolo C. Fienga - in Absolute Natural Colors (such as the colors that a human eye would actually perceive if someone were onboard the NASA - Cassini Spacecraft and then looked outside, toward Saturn and the Saturnian moon "Tethys"), by using an original technique created - and, in time, dramatically improved - by the Lunar Explorer Italia Team. Different colors, as well as different shades of the same color, mean, among other things, the existence of different Elements (Gases and Minerals, respectively) present in the Atmosphere of Saturn, and on the Surface of Tethys, each having a different Albedo (---> Reflectivity) and Chemical Composition. Note: it is possible (but we, as IPF, have no way to be one-hundred-percent sure of such a circumstance), that the actual luminosity of Saturn and Tethys - as it is in this frame - would appear, to an average human eye, a little bit lower than it has been shown (or, better yet: interpreted) here.